Ms. Izumi Nakamitsu assumed her position as Under-Secretary-General and High Representative for Disarmament Affairs on 1 May 2017. 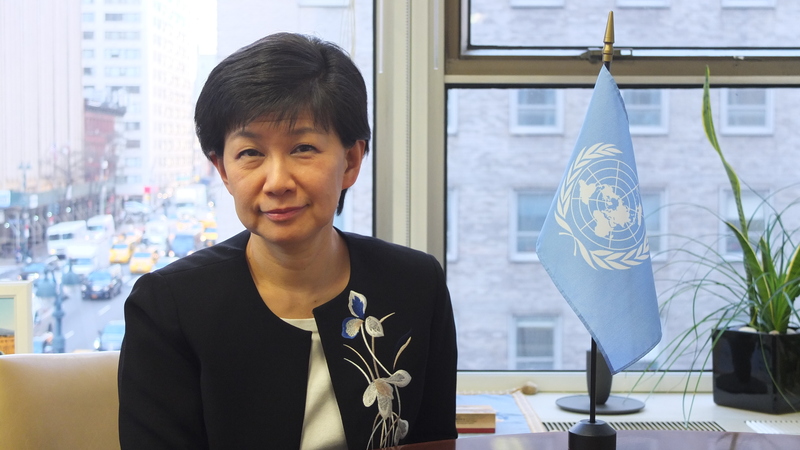 Prior to taking on this post, Ms. Nakamitsu served as Assistant Administrator of the Crisis Response Unit at the United Nations Development Programme (UNDP) since 2014. She has many years of experience within and outside the United Nations system, most recently as Special Adviser Ad Interim on Follow-up to the Summit on Addressing Large Movements of Refugees and Migrants between 2016 and 2017. She was previously Director of the Asia and the Middle East Division of the United Nations Department of Peacekeeping Operations between 2012 and 2014, and Director of the Department’s Division of Policy, Evaluation and Training, from 2008 to 2012. Between 2005 and 2008, Ms. Nakamitsu was Professor of International Relations at Hitotsubashi University in Tokyo, where she also served as a member of the Foreign Exchange Council to Japan’s Foreign Minister, and as a visiting senior adviser on peacebuilding at the Japan International Cooperation Agency. Between 1998 and 2004, she was the Chef de Cabinet and Director of Planning and Coordination at the International Institute for Democracy and Electoral Assistance, based in Stockholm, Sweden. Earlier in her career, Ms. Nakamitsu was a member of the United Nations Reform Team of former Secretary-General Kofi Annan. She also held positions with the Office of the United Nations High Commissioner for Refugees (UNHCR), including within the office of Assistant High Commissioner for Policy and Operations Sergio Vieira de Mello, and in UNHCR field operations in the former Yugoslavia, Turkey and northern Iraq.